Tower Lovrijenac (pronounced Lovr-ye-natz) is also known as St. Lawrence Fortress. 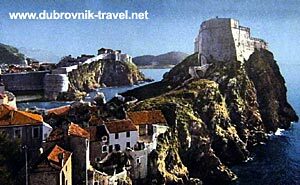 It is located on a large cliff just outside the western edge of Dubrovnik’s city walls. Lovrjenac has a triangular shape and includes three terraces that rise 37m above the Adriatic. 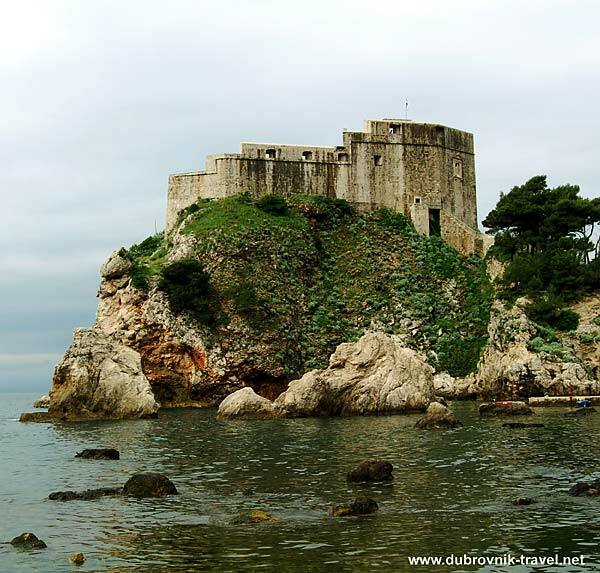 Walls of the tower facing the sea are up to 12m thick, while the ones facing Dubrovnik Town itself are much slimmer at only about 60cm. Above the main entrance to the tower, there is an inscription saying Non Bene Pro Toto Libertas Venditur Auro means “Freedom must not be sold for all the gold in the world”. The tower is accessed by sea via the small Kolorina / Pile bay (locally called U Pilama Kolorina) through a narrow and steep wooded path leading up to the drawbridges and entrance. Overshadowing the main town’s gate (Pile), the tower was built at the beginning of the 11th century when it has historically played an important role in resisting Venetian rule. 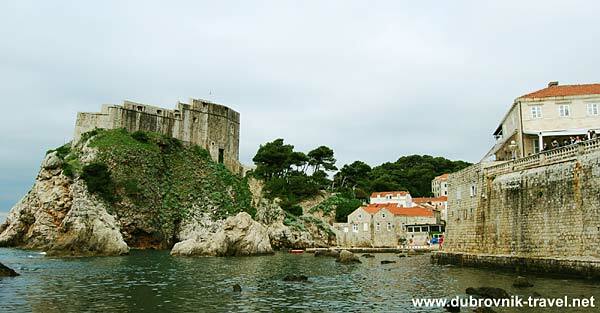 In 1018 the people of the Ragusa Republic had received intelligence that the Venetians were planning to build their own tower on this strategically-located cliff-top in their campaign to invade Dubrovnik. The Ragusian citizens decided they would erect it first which they managed in a speedy three months. The Venetians invaders were forced to turn back when they arrived in ships filled with building material and labourers. Lovrjenac nowadays serves as an attractive atmospheric venue during the Dubrovnik Summer Festival (Dubrovačke Ljetne Igre) for various concerts and theatre performances. Above the main entrance, there is a statue of the patron saint of the city, Sveti Vlaho (Saint Blaise). Note: The tower has no disabled access.